Would you recommend PH Trend to a friend? THIS is amazing. Well done, @cagriaksay. Here’s a visualization of today’s product rankings (so far): Any interesting learnings yet, Cagri? @rrhoover Thanks Ryan! It's still early to tell, but the most visible pattern is what I'd like to call the battle of 9am :) I believe it is the time newly approved products are released by the PH team. Graphs! Nice, and beautiful graphs too! Love it. Take my upvote! Love it. Tufte would be proud. Is this D3? @eawharton @mmezzacca Thanks! Yes, I'm using D3 by the great @mbostock. 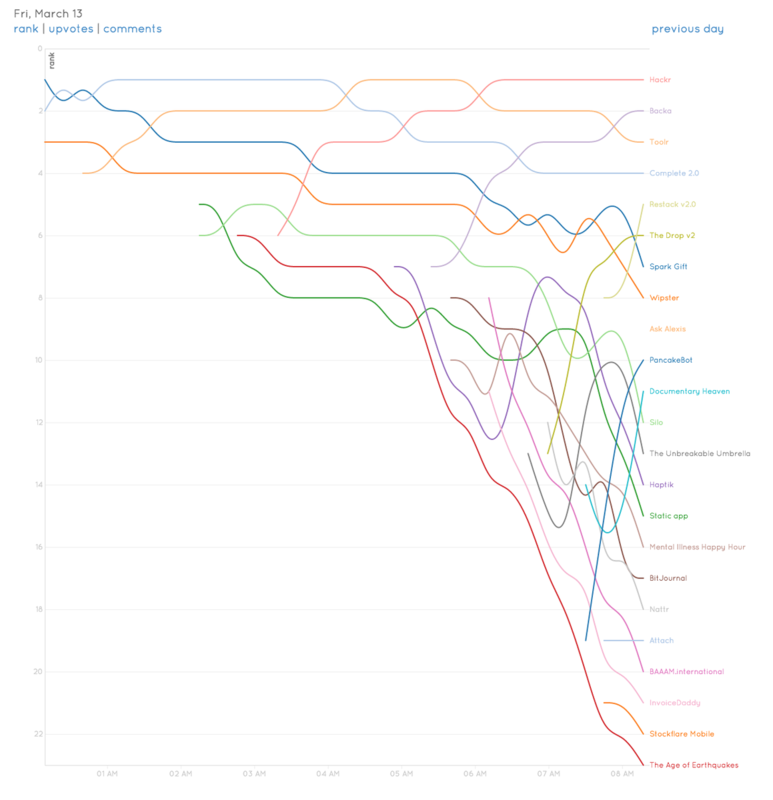 @eawharton "Made with Product Hunt, Kimono Labs, Tornado, D3.js." Nice patterns here :) One idea: make the product names on the right have 2 behaviors: > be links for the corresponding page on PH > highlight the line that corresponds to the product I'm hovering These behaviors were suggested since it can be hard to click on some products when lines are too close to other products or too short. Keep shipping! @johntheoak These are great suggestions! I'll work on them right away.